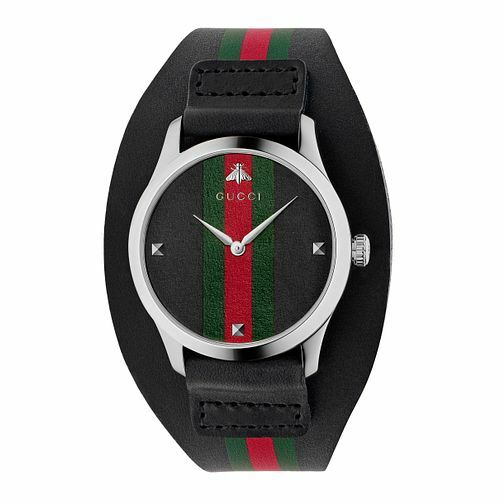 This smart and stylish unisex watch by Gucci is the perfect addition to the G-Timeless collection. A 38mm stainless steel case features a racing stripe dial with the colours of the Italian fashion house, three silver tone stud hour markers and the fly motif sitting upon the 12-o-clock position. Covered with sapphire crystal glass, this dial sits upon a stylish cuff design body, with co-ordinating racing stripes and finished with a black leather strap with buckle fastening.